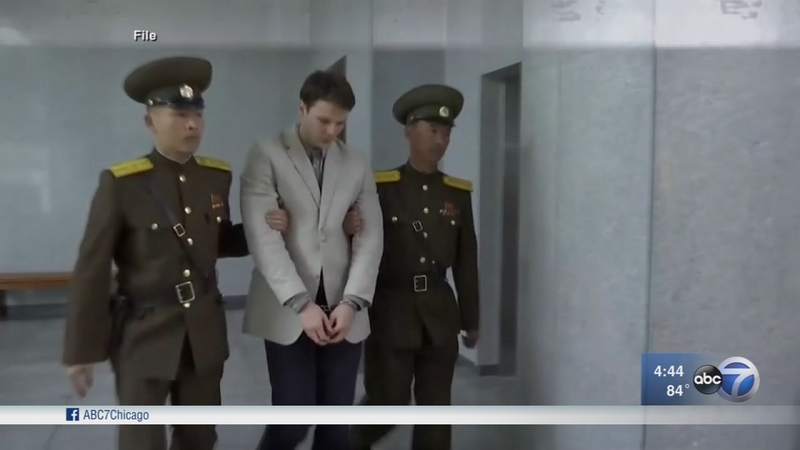 WYOMING, Ohio -- An American college student who was imprisoned in North Korea and returned to his home state of Ohio in a coma suffered a "severe neurological injury," a hospital spokeswoman said Thursday. Otto Warmbier is in stable condition at the University of Cincinnati Medical Center with his mother by his side, hospital spokeswoman Kelly Martin said. Doctors planned an update later Thursday. His father, Fred Warmbier, said he does not believe North Korea's explanation that the coma resulted from botulism and a sleeping pill. He said there was no reason for North Korea to keep his 22-year-old son's condition a secret and deny him top medical care. Fred Warmbier called his son's return bittersweet. "Relief that Otto is now home in the arms of those who love him and anger that he was so brutally treated for so long," he said at a news conference at Wyoming High School, where Warmbier graduated in 2013 as class salutatorian and played soccer. Blue-and-white ribbons in the school's colors were tied around the trees and utility poles all the way along the city's main road in a show of support. Warmbier also accused North Korea of luring Americans to the country with a Chinese tour company making the false promise they will never be detained. He said he received "a very nice phone call" Wednesday evening from President Donald Trump, who said Secretary of State Rex Tillerson worked hard to bring Otto home and asked how the family was doing. Warmbier said the family was "extremely grateful for their efforts and concern." Asked whether he thought the previous administration could have done more, Warmbier replied: "I think the results speak for themselves." Fred Warmbier told Fox News' Tucker Carlson on Wednesday that Otto was "terrorized and brutalized" during his 17-month detention and has been in a coma for more than a year. "The day after he was sentenced, he went into a coma," the father said in an interview scheduled to air Thursday night. He said he and his wife, Cindy, only learned of their son's condition last week. The University of Virginia student was medically evacuated from North Korea and arrived in Cincinnati late Tuesday. He was then taken by ambulance to the University of Cincinnati Medical Center. Residents of the northern Cincinnati suburb tied blue-and-white ribbons, the school colors, to trees near the family's home. Joy at his release was mixed with concern over his condition.